The divided Empire in AD 271. The Crisis of the Third Century, also known as Military Anarchy or the Imperial Crisis, (AD 235–284) was a period in which the Roman Empire nearly collapsed under the combined pressures of invasion, civil war, plague, and economic depression. 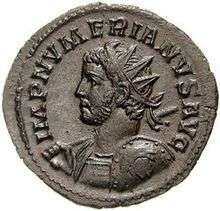 The Crisis began with the assassination of Emperor Severus Alexander by his own troops in 235, initiating a fifty-year period in which there were at least twenty-six claimants to the title of Emperor, mostly prominent Roman army generals, who assumed imperial power over all or part of the Empire. Twenty-six men were officially accepted by the Roman Senate as emperor during this period, and thus became legitimate emperors. 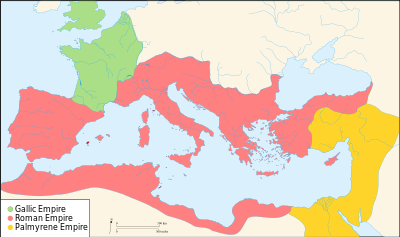 By 268, the Empire had split into three competing states: the Gallic Empire, including the Roman provinces of Gaul, Britannia and (briefly) Hispania; the Palmyrene Empire, including the eastern provinces of Syria Palaestina and Aegyptus; and the Italian-centered and independent Roman Empire, proper, between them. Later, Aurelian (270–275) reunited the empire; the Crisis ended with the ascension and reforms of Diocletian in 284. The Crisis resulted in such profound changes in the Empire's institutions, society, economic life and, eventually, religion, that it is increasingly seen by most historians as defining the transition between the historical periods of classical antiquity and late antiquity. 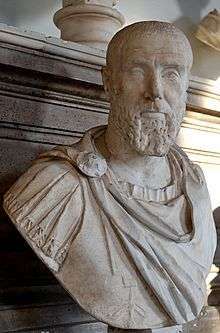 The situation of the Roman Empire became dire in 235 AD, when emperor Alexander Severus was murdered by his own troops. Many Roman legions had been defeated during a campaign against Germanic peoples raiding across the borders, while the emperor was focused primarily on the dangers from the Sassanid Persian Empire. Leading his troops personally, Alexander Severus resorted to diplomacy and paying tribute in an attempt to pacify the Germanic chieftains quickly. According to Herodian this cost him the respect of his troops, who may have felt they should be punishing the tribes who were intruding on Rome's territory. In the years following the emperor's death, generals of the Roman army fought each other for control of the Empire and neglected their duties of defending the empire from invasion. Provincials became victims of frequent raids along the length of the Rhine and Danube rivers by such foreign tribes as the Carpians, Goths, Vandals, and Alamanni, and attacks from Sassanids in the east. Climate changes and a rise in sea levels ruined the agriculture of what is now the Low Countries forcing tribes to migrate. Additionally, in 251, the Plague of Cyprian (possibly smallpox) broke out, causing large-scale death, possibly weakened the ability of the Empire to defend itself. After the loss of Valerian in 260, the Roman Empire was beset by usurpers, who broke it up into three competing states. The Roman provinces of Gaul, Britain and Hispania broke off to form the Gallic Empire. After the death of Odaenathus in 267, the eastern provinces of Syria, Palestine and Aegyptus became independent as the Palmyrene Empire, leaving the remaining Italian-centered Roman Empire-proper in the middle. An invasion by a vast host of Goths was defeated at the Battle of Naissus in 268 or 269. This victory was significant as the turning point of the crisis, when a series of tough, energetic soldier-emperors took power. Victories by the emperor Claudius II Gothicus over the next two years drove back the Alamanni and recovered Hispania from the Gallic Empire. 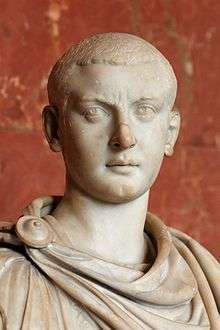 When Claudius died in 270 of the plague, Aurelian, who had commanded the cavalry at Naissus, succeeded him as the emperor and continued the restoration of the Empire. Aurelian reigned (270–275) through the worst of the crisis, defeating the Vandals, the Visigoths, the Palmyrenes, the Persians, and then the remainder of the Gallic Empire. By late 274, the Roman Empire was reunited into a single entity, and the frontier troops were back in place. More than a century would pass before Rome again lost military ascendancy over its external enemies. However, dozens of formerly thriving cities, especially in the Western Empire, had been ruined, their populations dispersed and, with the breakdown of the economic system, could not be rebuilt. Major cities and towns, even Rome itself, had not needed fortifications for many centuries; many then surrounded themselves with thick walls. 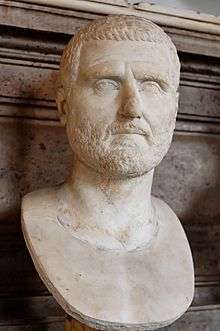 Finally, although Aurelian had played a significant role in restoring the Empire's borders from external threat, more fundamental problems remained. In particular, the right of succession had never been clearly defined in the Roman Empire, leading to continuous civil wars as competing factions in the military, Senate, and other parties put forward their favoured candidate for emperor. Another issue was the sheer size of the Empire, which made it difficult for a single autocratic ruler to effectively manage multiple threats at the same time. These continuing problems would be radically addressed by Diocletian, allowing the Empire to continue to survive in the West for over a century and in the East for over a millennium. Several emperors who rose to power through acclamation of their troops attempted to create stability by appointing their descendants as Caesar, resulting in several brief dynasties. These generally failed to maintain any form of coherence beyond one generation, although there were exceptions. 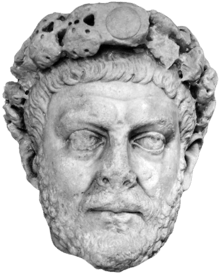 Emperor Diocletian. With his rise to power in 284, the Crisis of the Third Century ended and gave rise to the Tetrarchy. Internally, the empire faced hyperinflation caused by years of coinage devaluation. 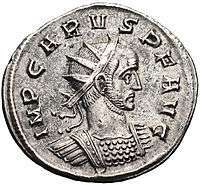 This had started earlier under the Severan emperors who enlarged the army by one quarter and doubled the legionaries' base pay. 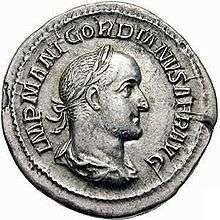 As each of the short-lived emperors took power, he needed ways to raise money quickly to pay the military's "accession bonus" and the easiest way to do so was by inflating the coinage severely, a process made possible by debasing the coinage with bronze and copper. This resulted in runaway rises in prices, and by the time Diocletian came to power, the old coinage of the Roman Empire had nearly collapsed. Some taxes were collected in kind and values were often notional in bullion or bronze coinage. Real values continued to be figured in gold coinage, but the silver coin, the denarius, used for 300 years, was gone (1 pound of gold = 40 gold aurei = 1000 denarii = 4000 sestertii). This currency had almost no value by the end of the third century, and trade was carried out without retail coinage. One of the most profound and lasting effects of the Crisis of the Third Century was the disruption of Rome's extensive internal trade network. Ever since the Pax Romana, starting with Augustus, the empire's economy had depended in large part on trade between Mediterranean ports and across the extensive road systems to the Empire's interior. Merchants could travel from one end of the empire to the other in relative safety within a few weeks, moving agricultural goods produced in the provinces to the cities, and manufactured goods produced by the great cities of the East to the more rural provinces. Along these roads passed an ever-increasing traffic, not only of troops and officials, but of traders, merchandise and even tourists. An interchange of goods between the various provinces rapidly developed, which soon reached a scale unprecedented in previous history and not repeated until a few centuries ago. Metals mined in the uplands of Western Europe, hides, fleeces, and livestock from the pastoral districts of Britain, Spain, and the shores of the Black Sea, wine and oil from Provence and Aquitaine, timber, pitch and wax from South Russia and northern Anatolia, dried fruits from Syria, marble from the Aegean coasts, and – most important of all – grain from the wheat-growing districts of North Africa, Egypt, and the Danube Valley for the needs of the great cities; all these commodities, under the influence of a highly organized system of transport and marketing, moved freely from one corner of the Empire to the other. Large landowners, no longer able to successfully export their crops over long distances, began producing food for subsistence and local barter. Rather than import manufactured goods from the empire's great urban areas, they began to manufacture many goods locally, often on their own estates, thus beginning the self-sufficient "house economy" that would become commonplace in later centuries, reaching its final form in the Middle Ages' manorialism. The common free people of the Roman cities, meanwhile, began to move out into the countryside in search of food and better protection. Made desperate by economic necessity, many of these former city dwellers, as well as many small farmers, were forced to give up hard-earned basic civil rights in order to receive protection from large land-holders. In doing so, they became a half-free class of Roman citizen known as coloni. They were tied to the land, and in later Imperial law their status was made hereditary. This provided an early model for serfdom, the origins of medieval feudal society and of the medieval peasantry. Even the Roman cities themselves began to change in character. The large, open cities of classical antiquity slowly gave way to the smaller, walled cities that became common in the Middle Ages. These changes were not restricted to the third century, but took place slowly over a long period, and were punctuated with many temporary reversals. However, in spite of extensive reforms by later emperors, the Roman trade network was never able to fully recover to what it had been during the Pax Romana (27 BC – AD 180) of the first century AD. This economic decline was far more noticeable and important in the western part of the empire, which was also invaded several times during the century. Hence, the balance of power clearly shifted eastward during this period, as evidenced by the choice of Diocletian to rule from Nicomedia in Asia Minor, putting his second in command Maximian in Milan. This would have considerable impact on the later development of the empire with a richer, more stable eastern empire surviving the end of Roman rule in the west. While Imperial revenues fell, Imperial expenses rose sharply. More soldiers, greater proportions of cavalry, and the ruinous expense of walling in cities all added to the toll. Goods and services previously paid for by the government were now demanded in addition to monetary taxes. The steady exodus of both rich and poor from the cities and now-unprofitable professions forced Diocletian to use compulsion; most trades were made hereditary, and workers could not legally leave their jobs or travel elsewhere to seek better-paying ones. The decline in commerce between the Imperial provinces put them on a path towards increased self-sufficiency. Large landowners, who had become more self-sufficient, became less mindful of Rome’s central authority, particularly in the Western Empire, and were downright hostile towards its tax collectors. The measure of wealth at this time began to have less to do with wielding urban civil authority and more to do with controlling large agricultural estates in rural regions, since this guaranteed access to the only economic resource of real value — agricultural land and the crops it produced. The common people of the Empire lost economic and political status to the land-holding nobility, and the commercial middle classes waned along with their trade-derived livelihoods. The Crisis of the Third Century thus marked the beginning of a long gradual process that would transform the ancient world of Classical antiquity into the medieval one of the Early Middle Ages. ↑ Brown, P, The World of Late Antiquity, London 1971, p. 22. ↑ " Herodian says "in their opinion Alexander showed no honourable intention to pursue the war and preferred a life of ease, when he should have marched out to punish the Germans for their previous insolence" (Herodian vi.7.10). ↑ Southern, Pat (2011-02-17). "Third Century Crisis of the Roman Empire". BBC History, 17 February 2011. Retrieved from http://www.bbc.co.uk/history/ancient/romans/thirdcenturycrisis_article_01.shtml. ↑ H. St. L. B. Moss, The Birth of the Middle Ages, p. 1. Klaus-Peter Johne (ed. ), Die Zeit der Soldatenkaiser (Akademie Verlag, Berlin 2008).